The origin of the Dakhla Glass (DG) had puzzled scientists since MAXINE KLEINDIENST discovered it in 1987 nearby the Dakhla Oasis (Egypt). 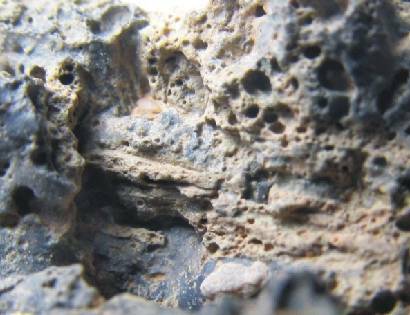 Some researchers had suggested the "Stone Age" glass may have been produced by burning vegetation or lightning strikes. But a chemical analysis showed that the glass was created in temperatures so high that they could only have been the result of an impact event. Gordon Osinski, a geologist at the Canadian Space Agency in Saint-Hubert who conducted the analysis, found that the glass samples contain strands of molten quartz, a signature of meteorite impacts. 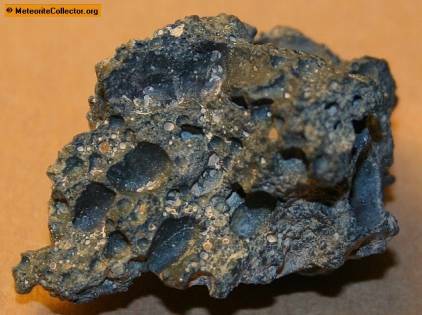 "The Dakhleh Glass-forming impact event occurred during the Middle Stone Age time of occupation, but the timing of this event has not been well established. 40Ar/39Ar incremental heating of three aliquots from a sample of Dakhleh Glass yield data that can be ascribed to quenched glass which efficiently purged radiogenic 40Ar inherited from the target rocks. 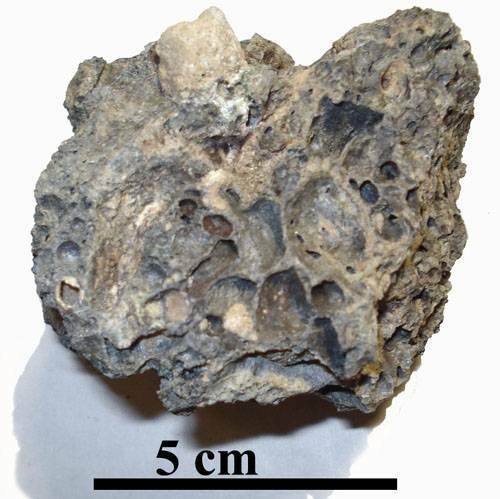 One of the aliquots yielded data suggestive of an undegassed clast of target material, but these are easily resolved. The age of the impact event is determined from a compositionally filtered subset of the data that yield an isochron age of 145 ± 19 ka." 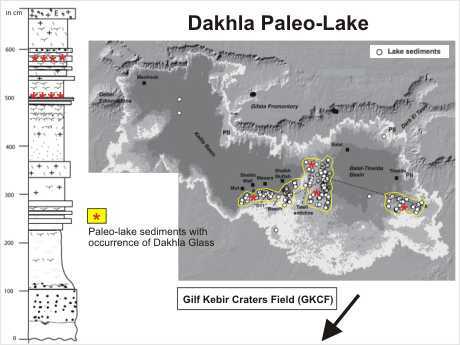 Fragments of so-called Dakhla Glass appear in clumps of ancient lake sediment. 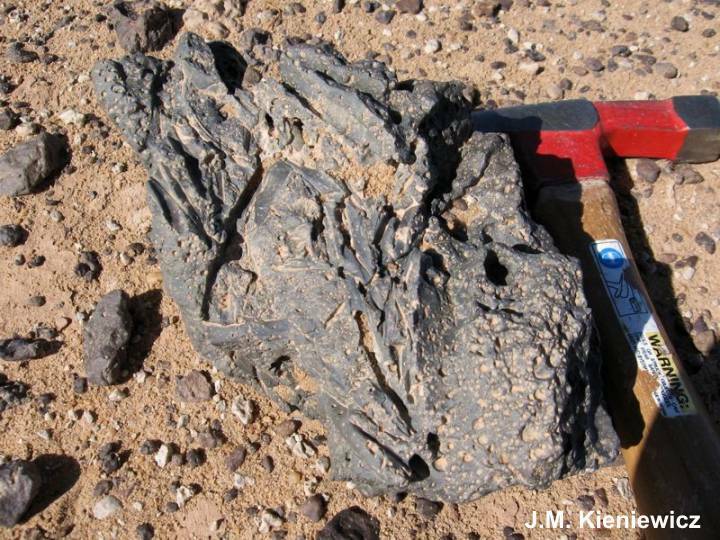 The Dakhla "Glass" is a glassy andesitic lava ! Apparently is the occurrence of "Dakhla Glass" associated with Middle Pleistocene lacustrine sediments in situ. But this can be a fallacy. It can be also moved material of older period, coming from distantly regions. A determination of the age of the material of ~150 ka is mysterious. It is assumed that this indicates the age of the sedimentary embedding and so the age of the Paleo-lake. Dakhla glass is quite variable. Smaller pieces tend to be highly vesiculated while bigger lumps can be mostly crystalline and dense. The glass is chemically distinctive, being unusually rich in calcium and aluminum. 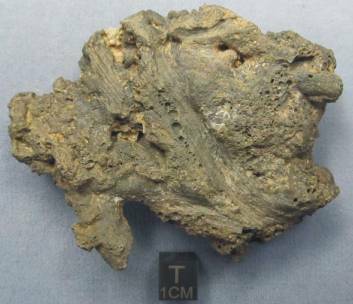 It contains small enclaves of very high silica glass (lechatelierite) which forms at temperatures greater than 1700 degrees C. Interestingly, about one third of the pieces show imprints of plant matter on their surface, indicating that the original melt were still of sufficiently low viscosity. 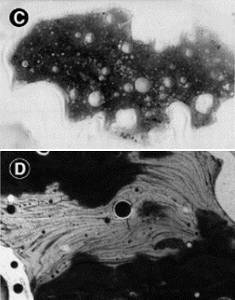 There is also sometimes seen a flow-stretching to the vesicles and a tendency for them to be present in greater abundance near the upper surface of a given specimen, again indicating fluid behavior that allowed the bubbles to stretch and rise. The plant residues must be from the Tertiary period. The striation on the surface point to a Phragmites (reed), which existed since the Tertiary period.. The plant residues are attached with the glassy mass and was transported together. 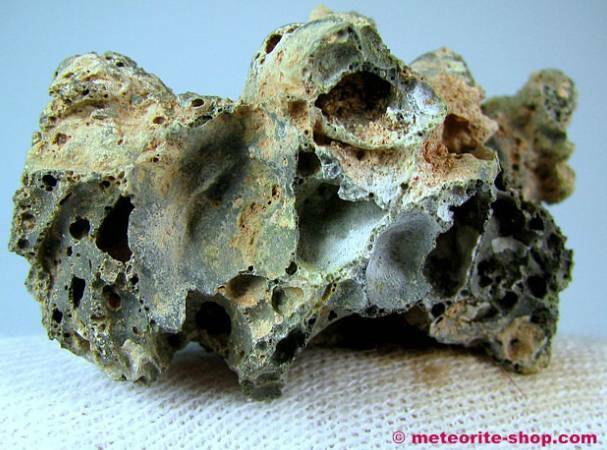 The Dakhla Glass (DG) was probably a volcanic glassy mass, mixed with gases. The new investigations (Osinski et al, 2008) confirm for me, that the DG's are redeposited, therefore it is not in situ. The glasses have probable a Tertiary age. The volcanic origin of the glassy mass in the context with the spread subvolcanic activities in the southwestern region is probable. Hydrovolcanic events are to be found everywhere in the region, also in the White and Black Desert in the north (look here). The Dakhla Glass (DG) is emerged at the same time like the Libyan Desert Glass. 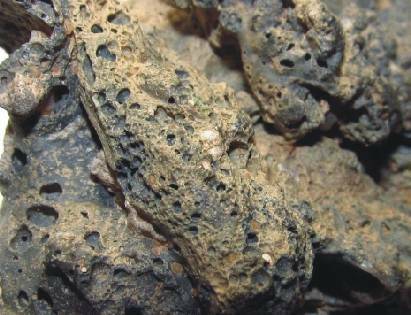 It consists mainly of gas-rich volcanic outflow mass, which are mixed with sediment. The Libyan Desert Glass (LDG) is probably orthomagmatic-hydrovolcanic of origin and have an age of ~28 Ma (Oligocene). Both glasses differ however by the chemistry and origin substantially (look here). 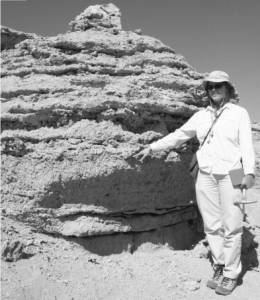 Between the Dakhla region and the Gilf Kebir plateau in the southwestern direction exists an immense amount of examples for subvolcanic activities in the Tertiary period (look here). 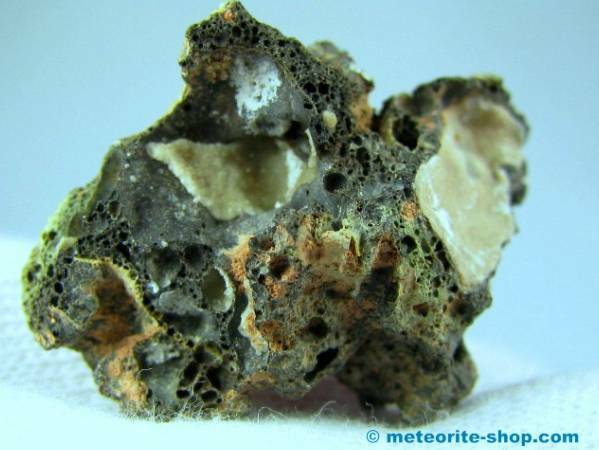 This region is rich of craters, basaltic plugs and dykes, which contain fused sandstones and breccias as well as fractured quartz grains. The place of the source is to be found in this large crater field of the "Scarp-Contours" in the southwestern direction. 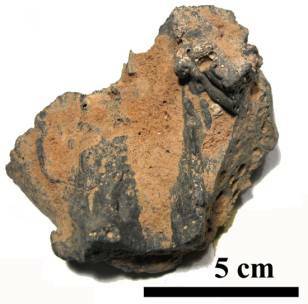 The Dakhla Glass (lava) after transport and destruction was deposited in a new position. 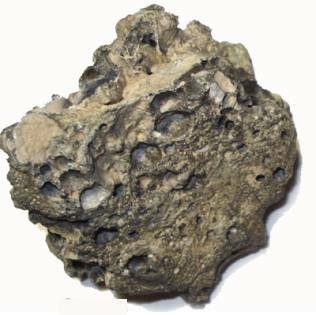 Now it is found allochthonous near Dakhla in younger paleo-lake sediments as lumps. The results of the analysis are therefore surprising, because obviously no exists a direct relationship to the basaltic effusions in the region of Gilf Kebir and elsewhere in Egypt. Therefore we can assume a special origin, similar to the origin of the LDG. In both cases, a reference to an impact or airburst event is absurd. 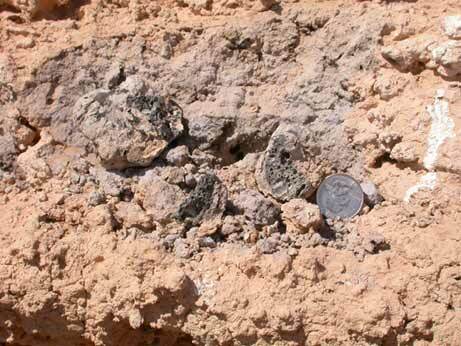 Already the attempt fails, to find target sediments for such compositions. It is sure igneous material, what came along of deep faults in this volcanic active region in the Oligocene period, in which also hundreds of subvolcanic structures emerged. 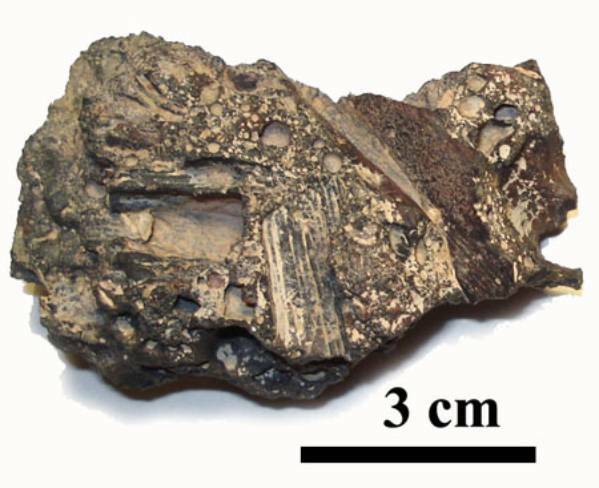 THE DAKHLEH GLASS: Product of an impact airburst or cratering event in the Western Desert of Egypt ? "Dakhleh Glass was first observed during regional archaeological and palaeoenvironmental surveys in the 1980s and 1990s (Kleindienst et al. 2006), with 6 known occurrences (Osinski et al. 2007). 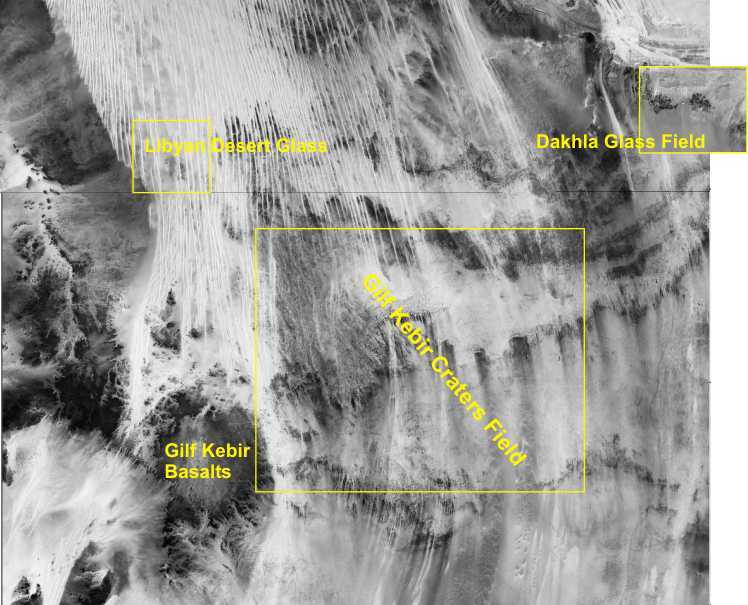 In 2007, we carried out a systematic search and discovered DG at ~140 different locations throughout the Dakhleh Oasis. Based on this new work, it is clear that DG occurs in 4 main settings: (1) as a lag deposit on the deflated surfaces of Pleistocene lacustrine CSS; (2) in situ within the same sediments as lag deposits on Taref Formation sandstone surfaces in close proximity to the Pleistocene lacustrine sediments, but in areas where these sediments have been completely removed, and (4) redeposited on, or into, Holocene pan sediments. Searches of both older Quaternary formations and younger alluvial terraces yielded no DG fragments. Thus, an important observation is that the DG glass appears to be spatially associated with Middle Pleistocene lacustrine sediments. Recent fieldwork shows that these sediments were deposited in a lake (s). DG is typically black when fresh and greenish-grey when weathered. Our new field observations indicate that individual specimens of DG vary markedly in terms of vesicularity, which is often a reflection of the size of the individual specimens. Smaller samples are typically highly vesicular, whereas larger masses, up to several kg and 30-40 cm across, are partially to fully crystalline. The majority of the large masses are flattened. 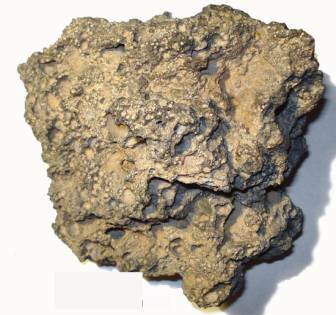 Several of these flattened masses possess irregular but moulded lower surfaces and flat, vesicular upper surfaces, with an increase in vesiculation upwards. Many of the larger pieces are whole masses and not fragments broken from larger blocks consistent with lack of significant movement/erosion following deposition. As noted previously, an unusual characteristic of the DG is that approximately one-third of DG specimens studied display impressions or “pyromorphs” of reed-like stems or leaves on the underside, or more rarely on other surfaces or internally, of the large flattened masses. DG has been found in situ within Pleistocene CSS of lacustrine origin. It is notable that sediments associated with the in situ DG, although chemically similar to the underlying lacustrine sediments, are reddened and occasionally contain charcoal and silicified organic matter, which are suggestive of burning. 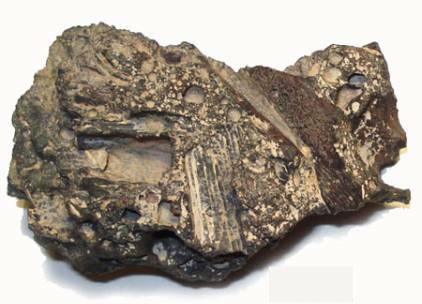 This is also consistent with the discovery of maghemite in association with the in situ glass, which has been documented in goethite-rich soils that experienced burning. 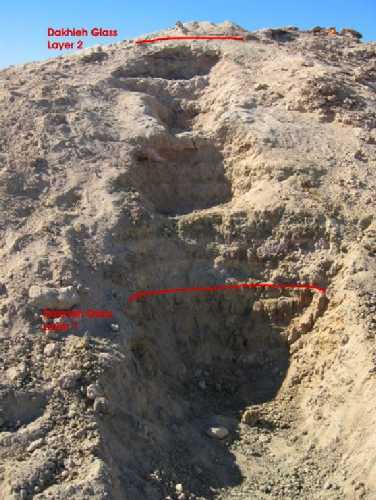 These “burned” sediments often occur in discontinuous lenses in the stratigraphy immediately above the DG in the western, Kellis Basin, and have also been documented in the eastern Teneida Basin, suggesting that fires across the Dakhleh Oasis region may have been a significant feature of the aftermath of the glass-forming event, implying the existence of moderately dense vegetation. Dewatering structures consistent with rapid deposition of sediment, as well as those that exhibit evidence for reworking, suggest that sediments may have been transported and redeposited from elsewhere in the basin. Optical and scanning electron microscopy observations mirror the field and hand specimen observations and show that the DG bodies vary markedly in terms of vesicularity. Despite its name, the Dakhleh Glass is typically rich in crystallites. Hypohyaline (i.e., >80% glass) samples are rare and hypocrystalline samples (i.e., mixtures of glass and crystals) predominate so that actual glass contents range from ~35 to 10 vol%. Completely crystalline samples are also present but are rare. In thin section, crystallite-free glassy areas within DG glass samples are colorless and transparent. The bulk of the DG samples, however, have a grainy and “spotty” appearance. This dark coloration can be explained by the interaction of incident light with the crystallites, resulting in reduced light transmission through the sample. The majority of DG specimens investigated display evidence for flow in the form of elongated and irregularly-shaped vesicles and intermingling of glasses of different composition. X-Ray Fluorescence data for 24 individual samples of DG are presented in Table 1. Given the bulk nature of these analyses (i.e., it was not possible to completely separate clasts, spherules, globules, and secondary alteration products from the glass), the data should be interpreted with caution; however, these analyses are useful for assessing the major geochemical properties of the DG. It is notable that the DG is typically CaO- and Al2O3-rich, although there are considerable variations (e.g., from 8 to 21 wt% CaO) between individual samples and between different locations. There is no systematic difference in composition between DG found as a lag and that found in situ. Alkalis are typically <2 wt%. Loss-on-ignition (LOI) data suggest the presence of variable amounts of volatiles. 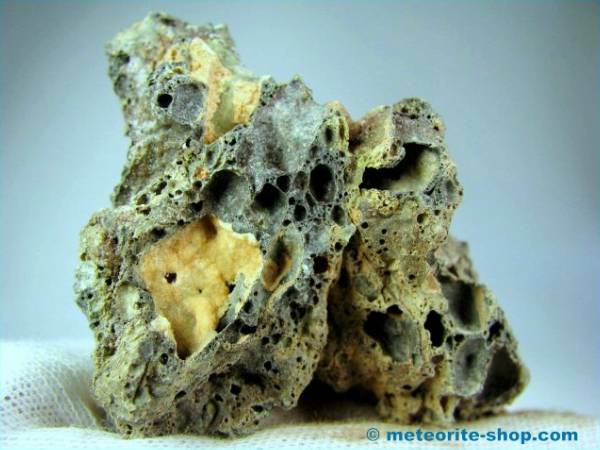 Some of these volatiles are undoubtedly bound in secondary phases such as calcite caliche and anhydrite; however, the systematically low WDS totals (typically 97–100 wt% in several samples suggest that the relatively high volatile contents may be original. 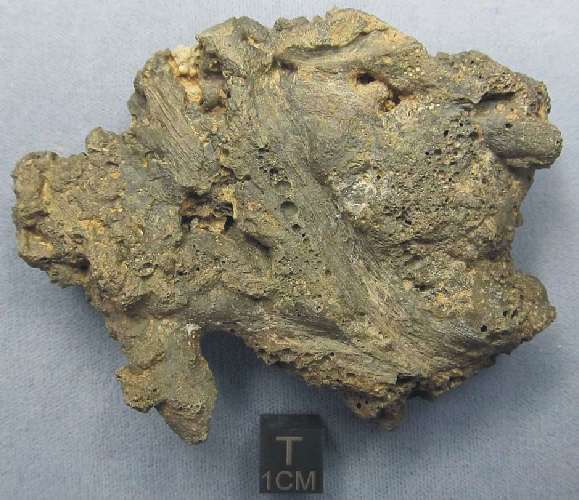 The lack of perlitic fractures also suggests that these volatile contents may be original. This is consistent with the pristine condition of the DG and the current hyper arid environment. Clinopyroxene has previously been identified as the most common crystalline component of DG. This mineral displays a variety of crystal shapes, with skeletal morphologies predominating. Such morphologies are indicative of rapid crystallization from a melt due to high degrees of undercooling and supersaturation. Larger mm-size acicular and tabular crystals show some zonation, with Mg-rich cores. In addition, these large crystals can contain spherical and irregularly-shaped globules of FeS. The pyroxenes display varied compositions. In the current study, we have also documented the presence of plagioclase crystallites in the DG for the first time. This identification is based mainly using element maps as the small size of the crystallites precluded an accurate determination of their composition. 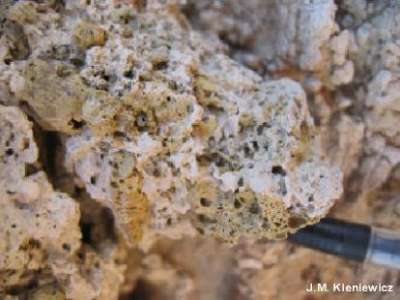 In the DG, small spherules of pyrrhotite and larger sized spherules and irregularly shaped globules of calcite are present. 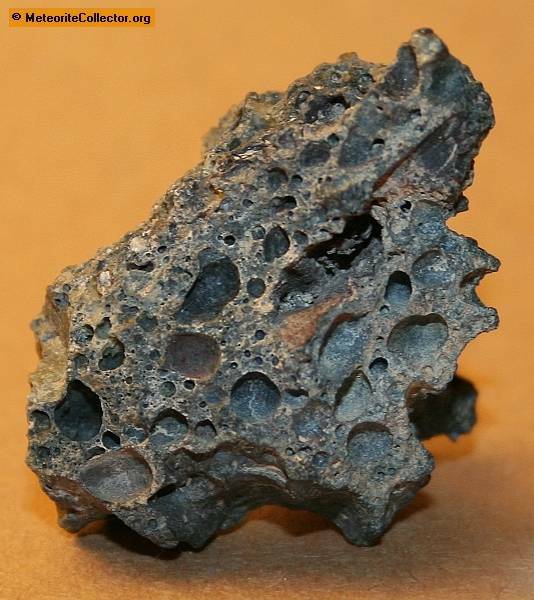 Pyrrhotite globules also occur within large clinopyroxene crystals. 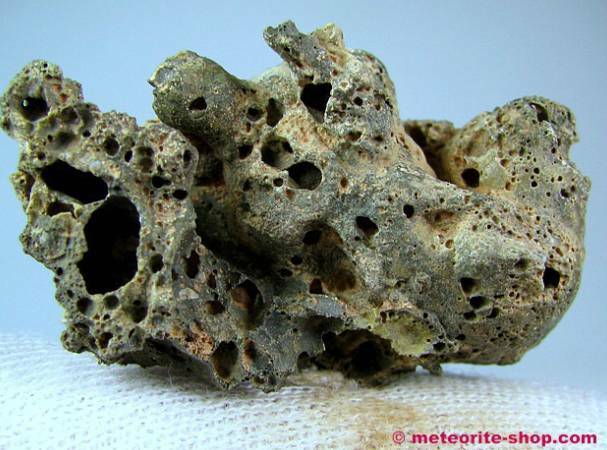 It is notable that the contact between the calcite globules and silicate glasses is always sharp, but often can be irregular with intermingling of the calcite and glass. 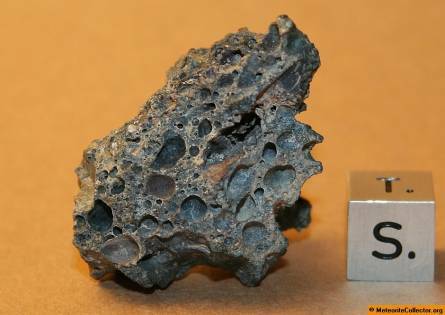 The calcite globule morphology contrasts with the secondary calcareous and sulfate vesicle fills, which are common in the uter few mm of many of the glasses. 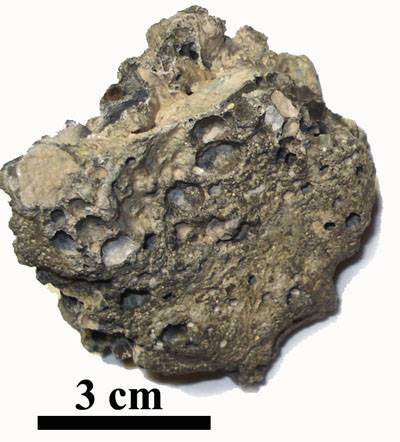 We have also identified individual spherules of DG in the Pleistocene lacustrine sediments. Clasts of lithic and mineral debris are found in all samples, but typically comprise <5 vol% of individual DG samples. 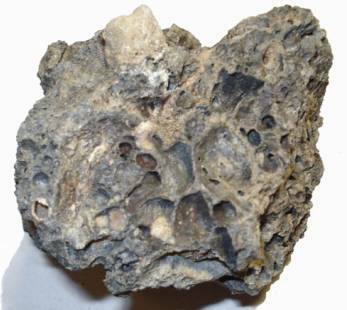 The most common clast type, found in all DG samples, are rounded to sub-rounded quartz grains. The amount of clastic material can range from <1 vol% to ~10 vol%. 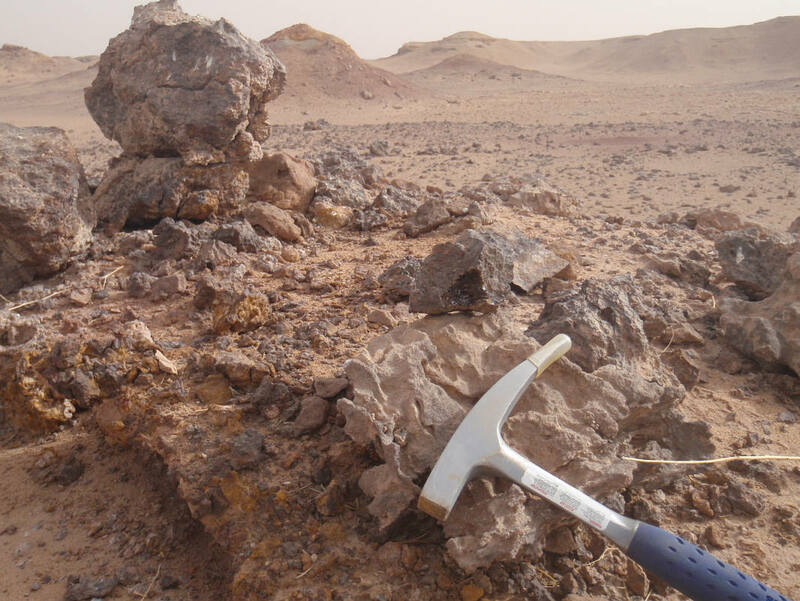 There is no systematic variation with respect to geographic location in the Dakhleh Oasis, or between in situ and lagged samples. The quartz grains typically display irregular fractures. No planar features have been found to date. 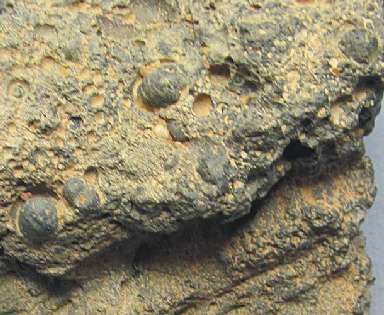 An unusual clast type can be seen. These elongate clasts comprise chains of circular holes, resemble cross sections of grass, sedge or reed leaves, and may represent recrystallized silica from phytoliths that retains some of its botanical structural organization; phytoliths are microscopic amorphous silicon dioxide particles that occur in various grasses (Piperno 2006). 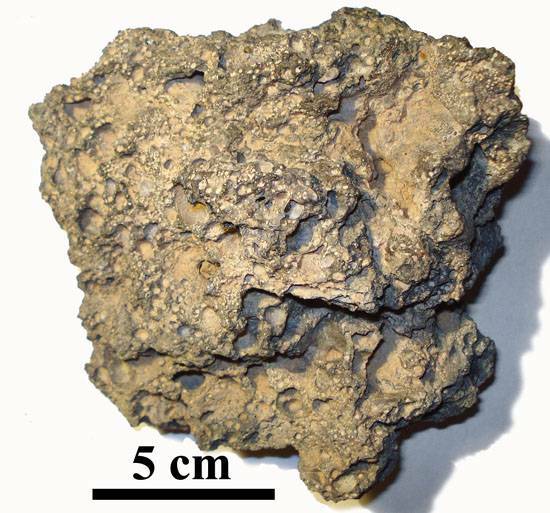 This is consistent with the presence of reed stem, root, and leaf casts in the CSS (Kieniewicz 2007). 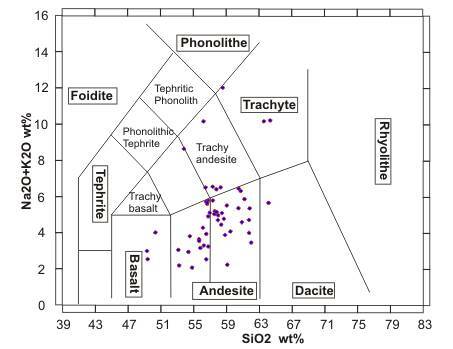 WDS analyses and element maps (not presented) confirm that these clasts are almost pure SiO2. 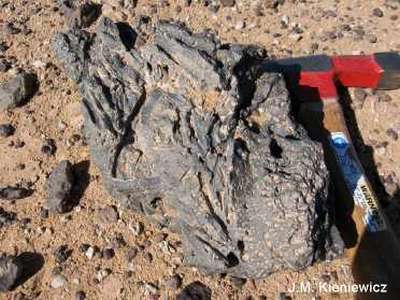 Small angular fragments of fine-grained calcareous sedimentary rocks of unknown origin have been found in 3 samples."